The line model represents a hydraulic pipe or hose with elasticity, inertia and pressure drop. It is assumed that the pipe or hose is round and has a certain length. The line model has two implementations: Default and MultipleCells. The default model of a line consists of two volumes for the compressibility of the fluid, a hydraulic inertia for the mass of the fluid and a friction element to model to friction of the fluid with the walls. The default line model contains the smallest number of elements to correctly represent the behaviour of a hydraulic line. A more detailed model is obtained by repeating these elements in cells. The more cells are used, the more detailed the fluid flow inside the line can be simulated. In general, the default line model will do fine for modelling hydraulic circuits. Only if long lines are used and the resonances, inside the line are important, the multiple cells line model should be applied. 2. Make sure it has the MultipleCells implementation: select Right mouse menu – Edit Implementation – MultipleCells. 3. Click Go Down to inspect the equations. 4. Change the value of the constant n from 4 to the number of cells that you require (n>1). 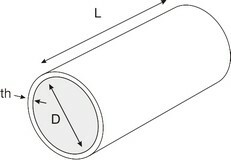 The pipe with length L [m], diameter D [m] and thickness th [m] will expand under if a pressure is applied by the fluid flowing in the pipe. where E is Young’s modulus [Pa]. where A is the pipe cross sectional area [m2] and rho is the fluid density [kg/m3]. where Q is the fluid flow [m3/s], D the pipe diameter [m], A the pipe cross sectional area [m2] and kv the kinematic viscosity [m2/s]. with dp the pressure drop [Pa] over the line, rho the density of the fluid [kg/m3] and v the average flow velocity of the fluid. Both terminals of the hydraulic inertia. Mass density of the fluid [kg/m3].